In the far future, Mars is dying a second time. The Final War of men and spirits is beginning. In a last bid for peace, disgraced champion Yoechakenon Val Mora and his spirit lover Kaibeli are set free from the Arena to find the long-missing Librarian of Mars, the only hope to save mankind. In the near future, a scientist running from a painful past, joins the Mars colonisation effort, cataloguing the remnants of its biosphere before it is swept away by the terraforming programme. When an artefact is discovered deep in the caverns of the red planet, the consequences ripple throughout time, affecting Holland’s present, the distant days of Yoechakanon, and the eras that bridge the aeons between. JO: What was the inspiration behind Champion of Mars? GH: Well, it’s been inspired by pretty much every book that has ever been written about Mars. Not that I’ve read them all. Edgar Rice Burrough’s Barsoom gets name-checked a lot when people talk about Champion of Mars, but surprisingly I’ve never read John Carter’s adventures in the original form. I have, however, been thoroughly exposed to them second-hand through geek culture – comics, pastiches, homages and the like (Moorcock’s Warrior of Mars is a key example). Other pulpy, SF adventures of the early 20th Century like Flash Gordon have a lot to answer for too. That sort of fallen, high-tech yet primitive society you see in Barsoom fascinates me; it’s a synthesis of fantasy and SF, planetary romance, and I love both. All these early dreams of the Red Planet were based on the faulty astronomical assumption that the planets were formed in order, from the outer planets in. According to this, Mars must be more ancient than Earth, and its societies therefore correspondingly older too. We know now obviously that this is not true, and that Mars does not possess intelligent life, but those tropes established by Burroughs – hearkening back to heroic mythology – are so interesting. So, the book began to take shape about nine years ago when I wondered how a society like that could come about now, as it almost certainly did not exist in the past. There’s that element of vast epochs, only we’re looking into the far future, and not into the distant past. I was also looking for a way to “justify” a sort of animistic world like my Martians have, where evolved AI take the place of spirits; that part of it’s a riff on the “internet of things” concept that gets bandied about. But if we’re looking for a moment of decision that really propelled me down this path to Mars, it was reading Liz Williams’ Banner of Souls for SFX, not long after I left the magazine. 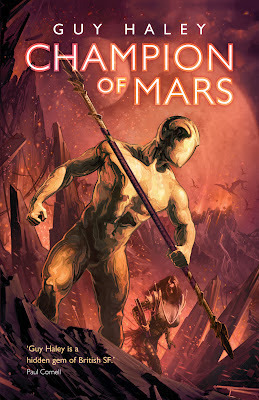 I was already writing what would become Champion of Mars when I read Banner of Souls, but it hurried me along. Banner of Souls infuriated me and captivated me in equal measure. I was particularly irked by Williams’ take on men. I think that’s why the love story aspect of Champion of Mars is so strong. (Williams’ character, Dreams of War, has a similar armour to Yoechakenon, come to think of it, and it’s also set on a far-future Mars, but in Champion’s case the inspirations for these things came from elsewhere. Okay, I’ll admit it; the armour is inspired by the black Spider-man alien symbiote, and Rom: Space Knight! Seriously). Ray Bradbury’s The Martian Chronicles is another of the main inspirations, especially regarding the structure. Although Martian Chronicles was not written as a cohesive narrative, the stories layer on top of each other to tell a single story beautifully (okay, one or two of them don’t fit quite so snugly as others). The interpolatory episodes linking the far and near futures together in Champion of Mars owe a lot to that. I called one “The Silver Locusts” (the alternative title of The Martian Chronicles, and the title of one of the stories in Bradbury’s book) as acknowledgment. You can’t go too far wrong with Bradbury, he’s a masterful prose stylist. He captures the melancholy sense of time’s passage better than anyone (except perhaps Tolkien). Again, Chronicles features deep time and an ancient, dying society. Bradbury’s themes of settlement and terraformation also inspired the near-future story arc, more so than Kim Stanley Robinson’s Mars trilogies, although if you look you can see the influence of both. The signs are consciously embedded in some parts, entirely subconsciously in others. William Hope Hodgson is another strong influence, even if he has nothing to do with Mars. In his The Night Land, mankind hides behind the walls of a giant pyramid from the horrors that haunt the eternal night of a far-future Earth. These things were unleashed by ancient sciences at some forgotten time in the past, and they inspired the Stone Kin of my book. Hodgson wrote cosmic horror in a similar vein to Lovecraft (whose works Hodgson’s predated), but his protagonists were two-fisted heroes like Doug McClure, and never gave up. Yoechakenon is in a similar vein to the unnamed hero of The Night Land, and I have my character bear a similar weapon to Hodgson’s “Diskos” in tribute. Finally, there is another, slightly weirder influence. When I was very young, three or four years-old, I used to dream regularly of being chased over a rocky desert under a yellow sky by a man with no face. Eventually, he caught me, and thrust his featureless head next to mine. It was fuzzy, like the atoms were diffuse as in a gas, and had the feel of static electricity. Then he let me go. After that, the faceless man never came back. This man was the model for Yoechakenon, in his armour, and which Dominic Saponaro has captured so well on the cover. JO: What are your favourite Martian novels or movies? GH: I love The Martian Chronicles, and Michael Moorcock’s Warrior of Mars. The League of Extraordinary Gentlemen, where Alan Moore has just about every Martian character ever appear over five pages of comic is brilliant. There have been a good many god-awful Mars movies, though, haven’t there? No wonder the film execs fret about the curse of Mars, a terrible hex that seems to affect space probes and films in equal measure. Total Recall is probably the best. I will say on the record that it was a dream folks – how do I know? Everything in Arnie’s adventure is discussed and specified at Recall at the beginning of the film, a good deal of it is shown on the screens. The technician loading up the tapes even says “Oh, Blue Skies Over Mars, this is a new one”. Arnie gets exactly what he pays for. I do love that film, especially because people still argue over what actually happened. JO: How would you describe your novel? GH: I wanted to write a modern-day planetary romance, one that combined those delicious pulp themes of yesteryear with the hard knowledge we have today about Mars. Stephen Baxter wrote a review for SFX, in which he said Champion of Mars brings together just about every Martian-type story you can imagine, and that was entirely my aim. It’s an adventure, there’s some genuine speculative aspects to it, there’s romance and action and Mars and spaceships and androids and a terrible extra-dimensional threat. It’s got something for everyone! JO: What would you list as your inspirations in SF? GH: Michael Moorcock, William Hope Hodgson, Ursula Le Guin, HP Lovecraft, Andre Norton, Sheri Tepper, Olaf Stapledon… There are so many. My trouble is not being influenced too much by the person I just read the last. JO: What is your writing process? GH: There’s a lot of work avoidance involved! On a typical day, I take my son to nursery, take my Malamute, Magnus out for a long walk and then start work. I don’t do anything really constructive until about 11am, but once I get going I can turn out 5000 words a day. If I’ve got any other work on – journalism, editing, publicity, whatever – I prefer to get that out of the way first. I find it hard to write and do other stuff in the same day, so I try to keep my writing days “pure”. But the mechanical act of writing is like 10% of the process, most of the actual story generation takes places ages before I sit down. I kind of load up my brain with ideas, then let it get on with it – I literally forget about it. It’s a bit like driving, which becomes a non-somatic activity. In reality, I think I’m probably “writing” all the time, it’s just that I’m not consciously aware of it. I feel the effects though. I do get a little disconnected from real life, forgetful and a bit snappy because 50% of my head is off somewhere else. If I get scenes and snatches of dialogue come through, I’ll generally make notes of them, but I’m loathe to actually start writing until I have a commission as I have very limited time. I do a lot of childcare, so only work part time – on top of that I really enjoy the back and forwards of idea exchange with an editor, as I think any creative work is stronger for collaboration, at least in my case, so I’m more likely to pitch a lot of ideas rather than fall in love with one and hound it to success. When I’m actually typing, it’s more like channelling than actively thinking up a story. Once I’ve written a book, I need a month or so off novel writing, or I literally go bonkers. I’ve just had that rest (I’ve been doing other work, not sitting around!) and I’m about to start my sixth book in April. JO: You're an incredibly busy man. What's next? GH: Well, Omega Point (the sequel to Reality 36) is out now from Angry Robot (it’s set in the same universe as Champion, folks!) I’ve three books out (two of which are already written) from a BIG GAMES COMPANY next year (can’t say who, but I bet you can guess). Aside from that on the writing front, I’m waiting to hear back on five or six proposals that are out there at the moment. If none of those come off, I’m gardening all year, and looking for a new job the year after. JO: Did you have to do a lot of research into the Red Planet for Champion of Mars? GH: Yes and no. I read a lot of science news – the majority through the BBC website or SPACE.com. I’ve always been interested in space science, so a degree of it was in my noggin already. On saying that, I obviously had to look up the specifics, thankfully the internet speeds that up immeasurably. I had my Times Space open face down on the Mars pages by me at all times, and a number of maps of Mars of varying types from all over the net on my desktop. I am thankful also to the X-Com-type game UFO: Afterlight (great game), for its brilliant, gradually transforming Mars globe! I learned a lot, especially about cellular biology, I tell you, writing SF is an education. I’m bound to have filled the book full of errors, although the fact that Mr Baxter didn’t pick me up on any is encouraging. The novel is a blend of hard SF and pulp SF. Was that quite difficult to pull off as they seem to me like genres that don't often sit well together. JO: The novel is a blend of hard SF and pulp SF. Was that a quite difficult to pull off as it often seems like they're genres that don't sit well together. GH: It was my aim to achieve this joining between many kinds of SF… If I succeeded or not is entirely down to the reader; but I will say that pulp is more of a tone than anything, and although the tone of this book tends deliberately to the pulpy, its subject matter is not. In fact, a lot of the SF I read as a kid was like this. Great SF was published alongside generic adventure in the old days, and a lot of it had a slightly fruity tone, even the great speculative works. I mean, look at the titles of Harlan Ellison’s stories! Great stories. JO: Do you think we'll see a manned mission to Mars in the next few decades? GH: Ooh, tricky. We certainly have the technology to do so. We have had for a long time, really – anyone going to Mars now would be doing it in more comfort than someone immediately post-Apollo, but they could have done it in the 1970s, I’m sure. So the question is the same it was forty years ago: is the political will there? Having said that, I think we’re reaching something of a critical mass in space exploration, what with private money and more nations developing space capability. Back in Apollo’s day, the commercial value of space was undefined, but now I don’t think anyone could argue with the potential out there. It still costs tens of thousands of dollars per pound to put anything into orbit, so it doesn’t make much sense to go and dig a load of iron up out of Ceres say, but we’ll soon reach a point – both because of growing resource scarcity on Earth, and advances in tech - where the cost-benefit of such ventures will become more favourable, especially when it comes to procuring rarer elements. Human beings are naturally Star Trek – we wouldn’t infest every crease in Gaia’s skirts if we weren’t always on the go. This natural impulse to explore and expand will push us off-world eventually, and permanently. Mars will inevitably be another human world one day, but in the next few decades, who knows? I hope there’s a man on Mars in my lifetime, hell, if there was a colony there I’d be off like a shot. Until then, we’ll just have to content ourselves with the awe-inspiring work NASA and other agencies do with robotic vehicles – personally, I can’t wait until the Mars Science Laboratory “Curiosity” touches down later this year. Champion of Mars is published in North America on April 24th and in the UK on 10th May. Digital copies will also be available through Amazon and the Rebellion store.